No one expects their pregnancy glow to be a grey glistening shadow that removes you from the world you once starred in. Slowly isolating you from day to day life and confining you to a lonely existence of survival. Welcome to the world of a HG sufferer. With my first pregnancy I experienced constant nausea until I was 25 weeks. The green look I was sporting was seen as unfortunate, but never diagnosed. So when I struggled to function in the first trimester of my second pregnancy I just kept thinking, it'll hopefully go before 25 weeks. Weeks of food aversions, intolerable smells, constant nausea, dry retching, violently vomiting and brain crushing headaches resulted in my first of two hospital admissions. 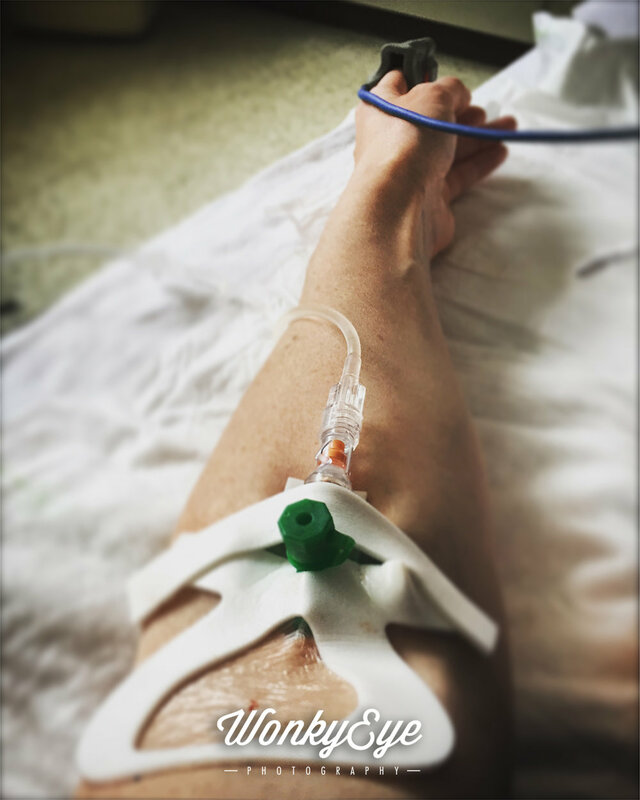 I was 17 weeks when, unable to walk upright from the gut wrenching vomiting or to keep my eyes open with the dehydration headache, I finally gave in and asked for help. One quick drip later and I saw Hyperemesis Gravidarum written on my notes. "Hopefully it will go soon", I was told. It went at 38 weeks and 4 days when my beautiful boy arrived early; saving me from the everyday endurance of being pregnant with HG. So few people know about this condition that when asked how I was feeling I usually lied and said, not too bad thanks. Otherwise, I was inviting a list of well meaning, but totally useless, advice about eating certain foods. The constant nausea makes even thinking about eating a struggle but the bile which sits in your throat makes even drinking next to impossible. I woke up every morning feeling like I would vomit, that feeling lasted all day, even when I did vomit. I had tissues and a plastic bag everywhere, coat pockets, car doors, my sons changing bag, my camera bag. I was able to eat breakfast, but not always keep it down. I managed a plain sandwich for lunch and by evening cereal was usually the best I could face. Exhausted, I was heavy with guilt that my son would want to play and I could only last a few minutes. Our walks to the beach were often abandoned when the seaweed was plentiful and the stench as we approached made us double back. My husband cooked dinner every night for himself and my son, and I watched from behind the closed glass doors as they sat together and I had to hide from the smell. Dinner time was the loneliest hour of my day, when HG forcibly removed me from our family life. By 32 weeks I was lying on three pillows a night trying to stop myself from vomiting. I couldn't sleep. Another bout of severe vomiting and sheer exhaustion resulted in me standing in the labour ward in floods of tears saying I couldn't cope. The very kind midwifes at UCHG led me straight to a room, hooked me up to a drip and gave me medication. I was always treated with such kindness and understanding by the staff but when I was examined the next morning by the doctor I was told it was probably a vomiting bug! He didn't know what to say when I told him that if that was the case I had had it for around 28 weeks. By now I was on daily medication and was asking about early induction, I couldn't see how I would last another 8 weeks, I could barely see how I would last another 8 days. The medication worked for a week and then stopped. I got new ones, stronger ones, and the same happened again. Not only was it not working properly but it was also very expensive. By 37 weeks I knew I wouldn't be induced so I willed the baby to come early and like a good boy he did what his mama asked! Within minutes of my son being born I could feel myself coming back. The famous post birth tea and toast was like fine dining, I couldn't stop eating. Within days my sister couldn't stop telling me how the light was back in my eyes, even now she is still shocked at "how good I look" and this is in the sleep deprived newborn stage! For me being pregnant with HG felt like as I was creating one precious, amazing life, I was suffocating my own. I felt lonely, exhausted and weak. I felt like a failure as a mother to my two year old and the baby I was struggling so hard to grow. I felt tired and didn't want to go anywhere. I felt like a failure as a wife and partner. I didn't call people or make an effort to meet people. I felt like a failure as a sister, daughter and friend. I was half hearted with work and stopped accepting job offers. I felt like a failure as a photographer. But looking back I was none of those things, I was doing the only thing I could, and that was survive. For myself, for my baby, for my family I kept my head down (the toilet a lot!) and just got on with it. Now I have my energy back it's time I lifted my head. I want people to understand what 1-2% of women go through when they are pregnant. If someone you know is going through this please don't dismiss it and say it will go, or tell them what worked for you when you had morning sickness. Ask them what you can do to help. Let them rant. Let them sit silently. Just be there. A new charity has been set up in Ireland, Hyperemesis Ireland; click here for information and support.